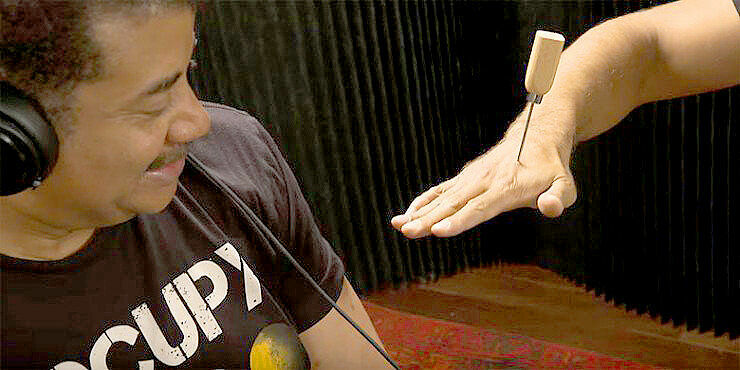 It's difficult not to squirm while watching this trick, so imagine how uncomfortable it must be to see it live. On Scott Vener's OTHERtone show Neil DeGrasse Tyson and Pharrell Williams shudder through magician David Blaine's very hard-to-watch ice pick trick. Before the trick DeGrasse Tyson reveals how optical illusions are actually just brain fails, but then even he is impressed when Blaine gets real with the ice pick. The trick involves Blaine sticking the ice pick through his hand but somehow it doesn't produce any blood or even a mark. As Pharrell is just too horrified by it, it's left to DeGrasse Tyson to pull the pick out, but when asked for an explanation DeGrasse Tyson is a little stumped at exactly how Blaine pulled it off. His assessment is that Blaine definitely does put the pick through his hand, but has a better understanding of human physiology, so is better placed to somehow manipulate or hack it to perform the trick. However, there is an explanation put forward by the website Secrets Explained which reveals the methods behind how magic tricks work. Their explanation is actually for a trick Blaine performs for Ricky Gervais, which involves Blaine putting a needle through his arm, but it could explain the ice pick trick also. In our research of this trick, we've discovered a medical phenomenon which can explain this performance best. It is called a fistula. In this case, a fistula is simply a path of scar tissue that goes through Blane's [sic] arm. This path allows for the needle to pass through his arm without damage or blood. He [Blaine] has a fistula through his arm. He created this fistula to himself, by repeatedly causing small damage to his arm in the same direction, probably by actually stabbing a needle into it. If this is the right explanation for the trick it means he's also done the same to his hand too. Which is kind of insane.